oil on unlined canvas, in its original frame by Cornelius Callaghan, Carver and Gilder, 24 Clare St, Dublin. Anon sale; Sotheby's, London, 2 June 1995, lot 236. A. Crookshank and the Knight of Glin, Ireland's Painters 1600-1940, New Haven and London, 2002, p. 200. This picture was one of four portraits of horses commissioned by James Hans Hamilton to be sold at the Sotheby's sale in 1995 all of which were then attributed to William Brocas. A receipt from 'Brocas' for £31.10.0. for painting three of these (including the present picture) in the then owner's family's possession was dated 1836. However, Anne Crookshank and the Knight of Glin (op.cit.) 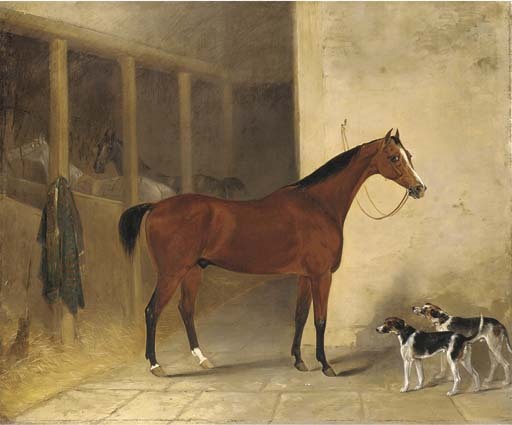 have, on the basis of a newly discovered portrait of a horse by James Henry Brocas, which is signed and dated 1835, reattributed this picture and the others to James Henry Brocas, the eldest son of Henry Brocas the elder (1762-1837).